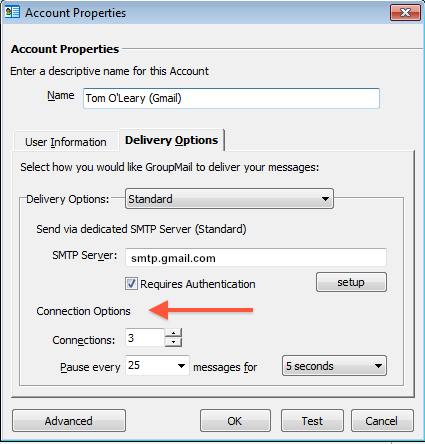 Not all SMTP mail servers were created equal. Some outgoing mail servers allow you to send high volumes of messages at very fast rates. Other mail servers limit the number of messages that you can send through them each hour or the rate at which you can process messages through them. One of the benefits of using email marketing software like GroupMail is that it allows you to send individual emails (instead of email to bcc: groups) very fast. It does this by using multiple delivery connections. This is one of the features that distinguishes email marketing software from standard email clients like Outlook and Outlook Express. GroupMail can send messages so fast, in fact, that some mail servers have a problem keeping up with the speed of delivery. Luckily GroupMail allows you to adjust the rate at which you send messages so that you can keep in line with your mail server’s capacity to process outgoing email. At the bottom of the Delivery Options screen (to get there, click Tools/Account Manager and click “Modify” on the Account Manager screen) you will see an area to adjust the number of delivery connections and an area where you can set your pauses. The more delivery connections that you have open, the faster GroupMail will send messages to your mail server. With the Personal Edition, you can open up to 3 simultaneous connections to your mail server. This means that you are actually sending three messages at a time to your mail server. The Business Edition allows you to open up to 256 simultaneous connections. By default, GroupMail pauses for 5 seconds after sending 25 messages. Generally, this is a rate that most mail servers can handle. If you notice that your mail server is dropping the connection (Server Timeout errors popping up between successful sends) then you might try reducing the number of connections that you have open and decreasing the number of messages sent between pauses to something like “pause for 5 seconds after every 5 messages are sent”. Because each mail server is different, you will have to experiment with your own mail server to discover the optimum settings to use. Interested? Get control of your email and download GroupMail email newsletter software today.